How to grade less, grade faster, and be a better teacher of writing. Ask any group of faculty what they find most taxing, frustrating, and draining about teaching, and late nights of grading large stacks of student papers reliably appears near the top of the list. Responding to student writers is one of the joys of teaching, but the raw volume of it— combined with doubts about whether the time we spend carefully writing out comments will translate to better student writing— can make it feel more like a chore than an opportunity to engage students as thinkers. Many faculty think of long hours spent grading student papers as the only way to honor the effort that students put into their writing, and to help their students to grow as writers. A growing body of research challenges this assumption. 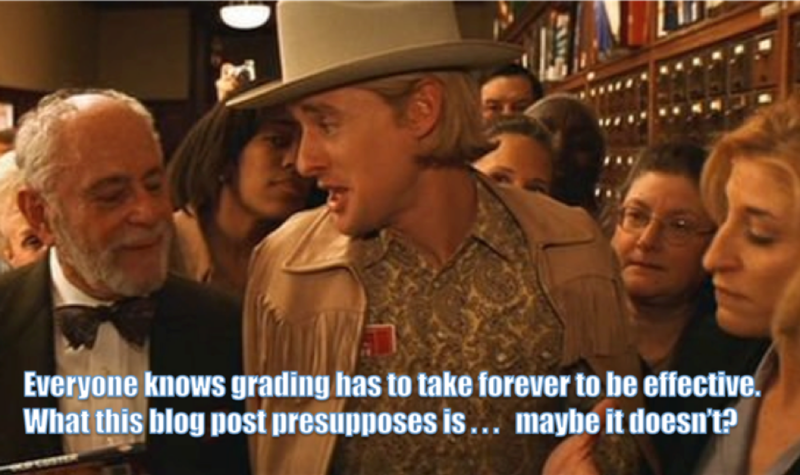 Time spent grading can detract from other aspects of teaching. The time and energy spent on grading has been often pinpointed as a key barrier to instructors becoming more innovative in their teaching. In some cases, the demands of grading require so much instructor attention, little time remains for reflection on the structure of a course or for aspirations of pedagogical improvement. Additionally, some instructors are hesitant to develop active-learning activities—as either in-class activities or homework assignments—for fear of the onslaught of grading resulting from these new activities. Students tend not to spend time with comments when they are attached to a final grade. It has been shown that when overall grades are presented, students focus on comparing their scores to their peers’ scores, and do not focus on feedback that is included for purposes of improvement. That is, when a grade is given, the impetus to revise is gone. Teachers should consider not presenting an overall grade along with feedback. Feedback is far more effective earlier in the writing process, when students are drafting and revising. Furthermore, if the goal is to create a class of better writers, learners, and critical thinkers, the instructor serving as the only source of feedback for student writing may deprive students of an important chance for growth. Students grow as writers by serving as editors, coaches, and even evaluators of the work created by their peers. Judging the correctness of answers is an additional opportunity for students to deepen their understanding about a topic. Reading another’s answers or simply spending time pondering another’s view may be enough for students to change their ideas or further develop their skills (Bloom & Krathwohl, 1956; Boud, 1989). Embedding grading as a part of a student’s learning experience can have benefits that go beyond learning specific subject-matter content (Brown, 1987)… Students become more aware of their own strengths, progress, and gaps (Alexander, Schallert, & Hare, 1991; Black & Atkin, 1996). Pupils develop a capacity to take initiative in evaluating their own work (Darling-Hammond, Ancess, & Faulk, 1995) and use higher order thinking skills to make judgments about others’ work (Bloom, 1971; Zoller, 1993; Zoller, Tsaparlis, Fastow, & Lubezky, 1997). This is certainly not to suggest that faculty, as experienced teachers of writing and as expert writers and thinkers within their fields, aren’t an important audience and source of feedback for the writing that their students create. But an important question to ask for any particular assignment is whether the goals of the course are better served by faculty feedback, student feedback, or some combination of the two. If long hours of providing intensive feedback on student writing doesn’t help our students to grow as authors within the areas of inquiry to which we are inviting them, what does? Anderson, Anson, Gonyea & Paine report in The Contributions of Writing to Learning and Development: results from a Large-Scale Multi-Institutional Study (2014), a large study that analyzes a host of data from the National Survey on Student Engagement, point to 3 factors that have a well-attested impact on student outcomes: interactive writing processes, meaning-making writing tasks, and clear writing expectations (more on those below). The study also has one more important implication for the time we spend grading. Effective writing practices are associated much more strongly than the amount of writing with greater student learning and development… There are undoubtedly instances where there is no student writing or so little that more would be salutary. However, the important lesson from our study is that quality matters— that in many situations it would be better to place more emphasis on the design and use of the assignments than on the number or size of them. Shorter writing assignments that take less time to grade (for example, microthemes) can be just as effective (if not more so, if designed in a way that honors the three principles above) as longer ones, and take much less time to grade. Interested in following Anderson, Anson, Gonyea & Paine’s data-informed advice on helping your students to grow as writers? There are a host of easily implementable tools that both follow principles of effective writing pedagogy, and reduce time spent grading. To engage your students in interactive writing processes, try conferencing with students early in the writing process, sending them to the Writing Center before final drafts are due, or implementing a peer review cycle. To have students grow as writers through meaning-making writing tasks, invest the time you’d usually spend grading on assignment design instead: create prompts that ask your students to think critically about problems that matter to them, and to write for an audience (even if an imagined one) with a stake in their ideas. To supply your students with clear writing expectations, create grading rubrics that both make clear to your students the complex, often discipline-specific criteria that are being used to assess their writing, and make grading a much faster, less painful process for you. Often, we teach writing based on our own experiences as students, and a sense that if we’re not doing things in the way that our professors did, we’re not doing the things that we’re supposed to do as teachers of writing. Recent research on how student learn to write points to ways that we can do better. It’s a happy surprise that many of these strategies can mean less time grading, and more time innovating (or, as is often even more important for ourselves and for our students: sleeping).